Wanting to escape the polluted and congested streets of Kuta – Bali’s main tourist hub – our taxi driver takes us to the Denpasar airport. There, we pushed and elbowed our way through the flip-flop wearing crowds to get to our gate, and soon we were flying over the sparkling blue ocean with islands spreading below us as flashes of tropical green amongst the water. In a blink of 30 minutes, we had arrived at Bali’s lesser- known neighbor – Lombok. As we exited the terminal the bright sky blinds us for a few seconds. The lack of touts is a welcome relief after the relentless “Hellos!” from the locals in Bali hawking souvenirs and taxi drivers grabbing for your patronage. We chose a taxi at our leisure and the driver eased out of the airport, lumbering onto a very modern looking highway lined with trees. An hour later, after crossing landscapes of rice paddy fields and lush mountains, we arrived at our hotel in Senggigi. The town is the main tourist area of the island lined with shops and restaurants, yet the vibe is slow and walking around is easy and peaceful. That night we feasted on freshly caught fish on the sandy shores of the bay, with lanterns swinging in the trees above us. The setting sun cast brilliant hues of orange across the water and nearby a local fisherman returned from his evening catch with buckets full of fish. As the sky darkened, the lights from the nearby Gili islands flickered in the distance. Many travelers come to Lombok to hike Mount Rinjani, the large volcano in the center of the island, but as the next morning dawned, we chose relaxation over adventure. We skipped the gruelling three-day climb and instead chose to visit a temple and an indigenous village. We hire a guide and driver, a man named Ketut, who greeted us with a welcoming smile. He’s originally from Bali, but moved to Lombok five years ago because he wanted to live on an island like the homeland he remembered from his youth. Soon as we arrived and began to cross the large landscaped park that leads to the entrance of the temple, we were mobbed by school children. “What your name, what your name?” they demanded of us, pulling us in for hugs and asking us to take their photo. After our impromptu photo session, where we also pose for a snap with the children’s teachers, we entered the peaceful grounds of the temple. Unlike Bali, where the majority of residents are Hindus, Lombok’s people are mostly Muslims although there is still a Hindu influence present on the island. Large mosques sit side-by-side with old Hindu temples. 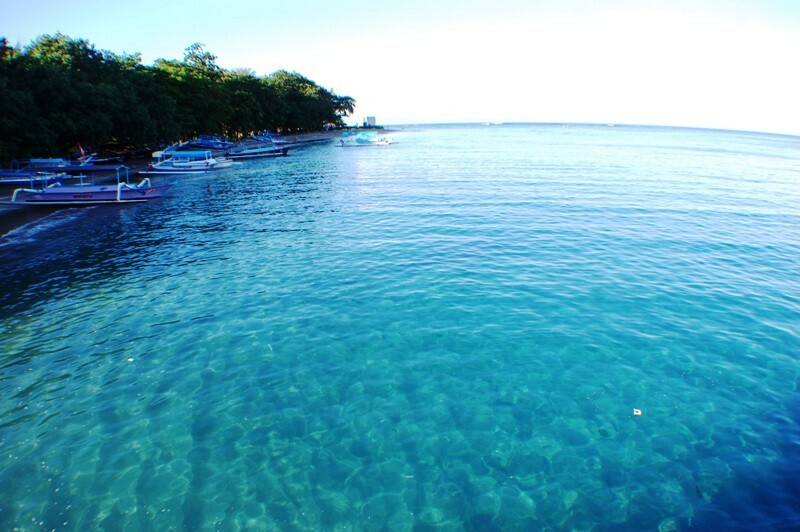 However, peacefulness didn’t come to Lombok easily. Back in the 17th century, the Balinese took control of the western side of Lombok while the Makassarese people had control of the east and by 1750, the entire island was under Balinese control. The Sasaks, the main ethnic group on the island, lived in harmony with the Balinese in the west, but in the east conflict arose. When the Dutch came in the 19th century they received support from the Sasak aristocracy and the Balinese people, while the poorer Sasaks were ignored. Even after Indonesia became independent from Dutch rule, the elite Sasak and the Balinese continued to rule the island. This influence can still be felt today in the cultural traditions that are practiced around Lombok. As we walked in to the temple grounds, Ketut explained how the Balinese living in Lombok come here to worship their gods, leaving small offerings of food and incense. The smoke from the incense floats upwards and is thought to connect those living on the earth with the gods in the sky. Elsewhere, temples built by former Balinese kings are still standing, and the Sasak people continue their Islamic traditions at their mosques. From the temple, we bundled back into the car and headed to Sakara Village where the Sasak people live. 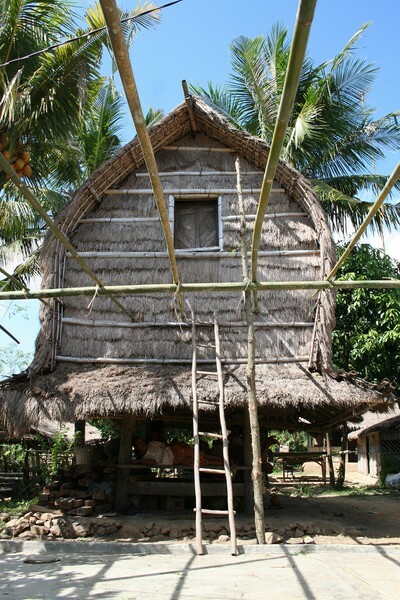 The villagers here speak their own language, which resembles Western Indonesian dialects but with its own unique sound. About 85 percent of the people remaining on Lombok are Sasak – the Balinese having long gone – and this is the only place in the world where their culture is still alive. To earn a living, the Sasaks have embraced tourism, turning old traditions into a viable source of income. 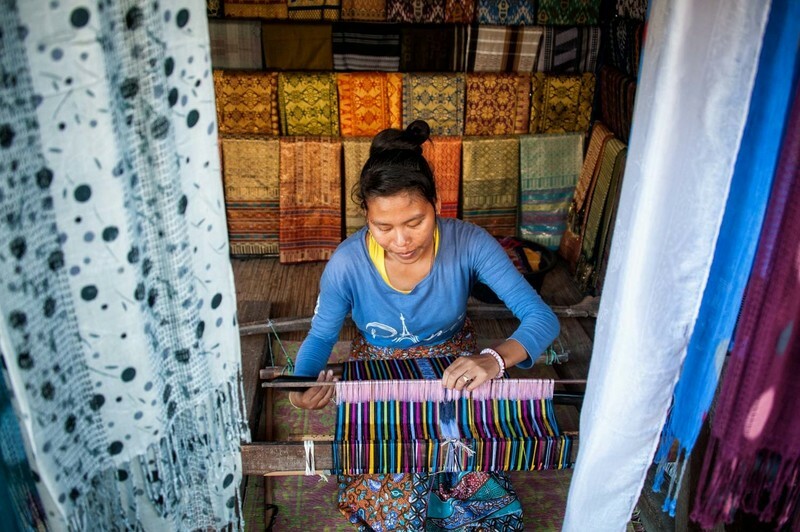 Women are scattered throughout the village, sitting on bamboo mats on the floors of their modest wooden homes hand weaving colorful rugs, sarongs and scarves, using the traditional method they call songket. One woman cradles her mobile phone between her shoulder and chin, speaking animatedly as she weaves with her hands. The contrast between the tradition and modernity is amusing. She was using gold and bronze threads within the detailing, making the cloth shine brightly in the sun. I was drawn to them like a magpie to a diamond. Seeing my interest, another woman who didn’t speak English beckoned me over with a smile cut deep into her heavily-wrinkled face. She pointed to the mat beside her and I sat as she showed me how to pull the wooden contraption up and down to make the threads weave together. After five or so minutes, with her friends laughing and clapping their hands around me, another woman approached and pulled me softly towards the biggest building in the village – the store. Inside, bright sarongs lined the walls in every color of the rainbow. Joined by her friend, the woman gently wrapped me in a sarong from head to toe. To finish off the look, they balanced a woven basket atop my head and led me back outside to pose near a traditional bungalow house built on stilts. I climbed the rickety ladder to the top and the women giggled as I posed with a lopsided smile. All the brightly colored fabrics in the store were available for purchase and I couldn’t resist purchasing two to decorate our home on our return. To my husband’s relief, Ketut called us back to the car and we rode on to Selong Belanak beach. We got stuck in a traffic jam as a wedding ceremony made its way down a hill towards us. The bride, beautiful in her thick makeup under the sweltering sun, looked exhausted. The car snaked slowly up the hill, past the bridal procession, where we rested. Before lay a bay in between two hills, white sand fading into the blue ocean, stretching as far as the eye can see. Eager to go for a refreshing dip, Ketut took us to the sandy shores. There were a few shacks dotted along the shore, serving fresh fish and rice dishes. We were thirsty, so we sipped on coconuts as we lounged under large umbrellas admiring the water before us, fringed with softly sloping lush green hills to either side. The temptation was too much to resist and before long we were racing towards the waves and diving under the clear blue sea. 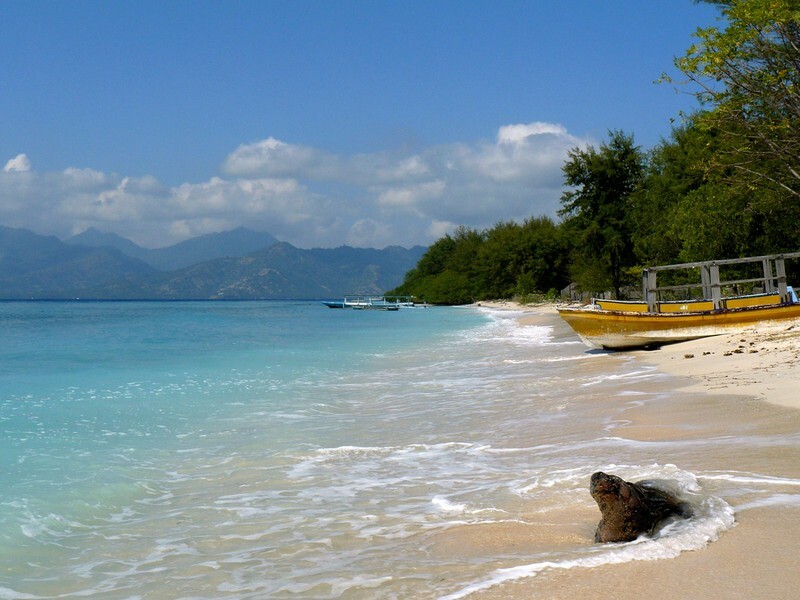 – There are regular flights from Bali’s Denpasar airport to Lombok, on carriers ncluding Garuda and Lion Air. Prices start from USD35 one way. Alternatively, you can get a ferry from Padang Bai in East Bali to Lombok, which takes about five hours, expect to pay around USD10 per person. – Hotel Tugu prides itself on displaying some of Indonesia’s cultural artefacts, decorating its accommodation with antiques and artworks. The romantic accommodation features numerous suites with four poster beds. Doubles start at USD280. – A private boutique beach resort, Cocotinos Sekotong is home to villas, a spa and a diving center. Located amongst a coconut grove in Sekotong Bay at the southwest side of the island, the resort offers white sandy beaches, a library, a restaurant and a number of spa treatments. Doubles start at USD198. – Located only a five-minute drive from the tourist hub of Senggigi, The Chandi Boutique Resort & Spa features a beachfront restaurant and bar, as well as 15 villas. Doubles start at USD150.